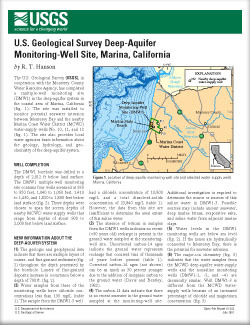 The U.S. Geological Survey (USGS), in cooperation with the Monterey County Water Resource Agency, has completed a multiple-well monitoring site (DMW1) in the deep-aquifer system in the coastal area of Marina, California (fig. 1). The site was installed to monitor potential seawater intrusion between Monterey Bay and the nearby Marina Coast Water District (MCWD) water-supply wells No. 10, 11, and 12 (fig. 1). The site also provides local water agencies basic information about the geology, hydrology, and geochemistry of the deep-aquifer system. Hanson, R.T., 2001, U.S. Geological Survey Deep-Aquifer Monitoring-Well Site, Marina, California: U.S. Geological Survey Open-File Report 01-242, 2 p.